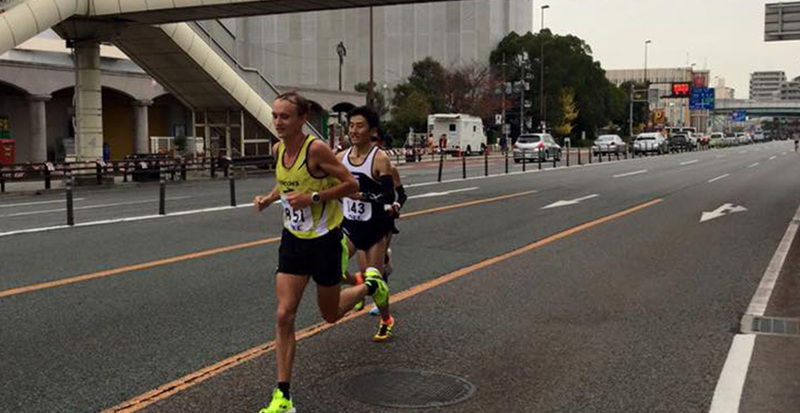 Australians Josh Harris and Stepen Dinneen and Josh Harris have just run the Fukuoke Marathon in Japan. Harris finished in 19th position, with a time of 2:20:27 and Dinneen finished 32nd with a time of 2:23:39. “2.23.39 – not the time I was hoping and found a few little things to work on before I toe the line for my next marathon. No complaints today – course was good, weather was good, good athletes to run with, preparation was good – I felt good & relaxed until 24-26km…..but it is 42.2km & my legs just didn’t have the required pace much after that. I got to halfway relaxed, feeling good – just not my day & that’s racing. It has put a few more logs (on top of a truck load of logs) onto that burning fire inside me to succeed they way I want to. Positive sign is that my bad days are getting better, it was still 3minutes quicker then my last marathon. Progress is progress! Also went past the current world record at the 5km mark – he was having a bad day! Special thanks to my darling wife Mel who has helped make this the best preparation so far. Always nice to lay down after a long day to see her & Brooklyn smiling. My family have been great as always – my mum actually funded my flights to get to this race (running doesn’t pay the bills). Thanks to my training squad boys, @boxhillathleticclub, Liam & Mitchel who keep my honest in training, Steve Moneghetti for his guidance, @brooksrunningau 7 yrs going strong, my therapists (Nigel / Andrew / Heidi /Paul / Liam ), thanks for flying over & being amazing support. And to everyone else for just being a champ in my life.